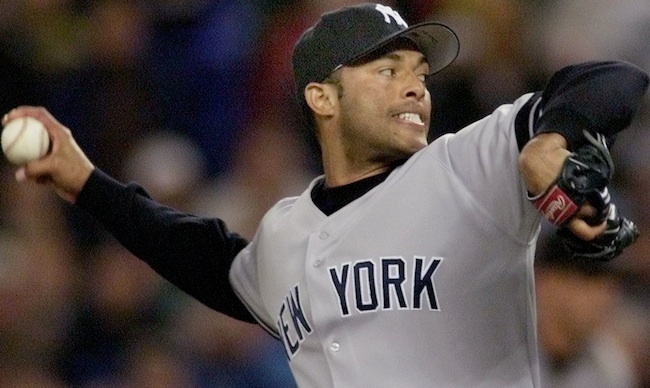 He lost the 2001 World Series for the Yankees—and proved his greatness in the process. Tonight, Mariano Rivera will play his last game in a New York Yankees uniform, capping off a remarkable professional baseball career. He will leave behind a collection of indelible memories, most of which involve triumph. Whenever Rivera, often referred to as the Hammer of God for the merciless manner in which he retired opposing batters, entered a game in the eighth or ninth inning, baseball fans could justifiably guess the game was over and that the Yankees would win. Rivera was that good; he was the closest thing the sport had to perfection. But for the rare sports fan who believes losing can actually be more meaningful than winning, the memory of Mariano Rivera that stands out most does not involve any one of his countless victories. It involves his most famous defeat: Game Seven of the 2001 World Series. In that series, the defending champion Yankees played the upstart Arizona Diamondbacks less than two months after 9/11. Due to the trauma inflicted on New York City and its citizens, the Yankees, perhaps for the first time in their long and storied history (certainly for the first time during the Steinbrenner era), briefly became America’s team. Though the boys in pinstripes had won four out the past five World Series and were beginning to develop a reputation for a “win at all costs” (and I mean that in a literal sense) approach to talent retention, relatively few sports fans outside the Valley of the Sun weren’t pulling for the Yankees to win another title and provide some much needed catharsis for a city still reeling. Through the first six games, Rivera did his part to bring another trophy back to the Bronx, recording a save (Game Three) and a win (Game Four) and contributing clutch relief pitching in a 12-inning Game Five victory. With the Yankees leading 2-1 heading into the eighth inning of Game Seven, in Phoenix, Yankees Manager Joe Torre inserted Rivera into the game. When Rivera strolled onto the mound, it seemed as though his team was set to extend their reign for another year. Rivera entered the game with an ongoing string of 23 consecutive postseason saves. In 51 career postseason games, he’d posted an ERA of .70, the lowest of any pitcher ever. Given his prior postseason mastery, it seemed unfathomable that the Diamondbacks could get two runs off Rivera and complete a comeback. Yet Arizona didn’t seem fazed at the prospect of facing arguably the greatest closer in the history of baseball. During the telecast Joe Buck, calling the game for Fox, mentioned that Diamondbacks Manager Bob Brenly had said his dream was to come back to Arizona after the three losses his team suffered in New York and not only win the series but beat Rivera in the process. Now that opportunity was there. It didn’t start well for the Diamondbacks. In the eighth inning, Rivera gave up one hit but struck out three batters without allowing up a run. Entering the ninth with the Yankees still leading 2-1, it seemed like the Hammer of God would once again quash the hopes of an opposing team and emerge victorious. But then, almost inexplicably, things changed. Rivera gave up a single to the first Diamondbacks batter. An errant throw to second on a bunt put another runner on base with no outs. After a failed bunt attempt resulted in an out, a Diamondback batter drove in a run with a double. Rivera then hit the next batter, which brought Luis Gonzalez, who was having one of the best seasons in the majors, to the plate with the bases loaded. That sequence, in which Rivera gave up the tying run and then loaded the bases, was somewhat unbelievable. Here was a player who never failed to deliver in clutch failing to deliver in the clutch. Witnessing the unraveling of a semi-mythic athlete who’d never failed to deliver on the biggest stages felt surreal, like watching the mighty Achilles get taken out by unimpressive Paris in real time. In spite of his struggles, it seemed likely Rivera would find a way to pitch his way out of the situation. He had struck out Gonzalez the previous inning. Perhaps, the Hammer of God was just making things a little more dramatic. But the unthinkable continued to happen. Gonzalez hit a bloop single to center field, and the Diamondbacks won the game 3-2. They had vanquished the untouchable Rivera and the mighty Yankees. Though Gonzalez was a power hitter who had crushed 57 home runs that season, he understood power hitting was not the way to beat Rivera. So he cribbed a technique from little league and choked up on his bat. He would later tell reporters, “To be honest, that's the first time I choked up all year.” The improvisation worked. The swing on which he connected with the ball resulted in a broken bat, but it also resulted in the hit that shattered Mariano Rivera’s veneer of invincibility. Whenever I think about that game and the way Rivera lost it, a quote from sportswriter Brian Philips pops into my head: “Our sports culture may value winning over everything, but there's nothing more epic than tragic defeat.” Rivera’s blown save, which prevented the Yankees from bringing a World Series trophy to a city in pain and proved the great closer fallible, was professional sports at its most tragically epic. As the Diamondbacks celebrated the most dramatic ending to a season that is possible, Rivera walked to the dugout in a manner that can only be described as quietly dignified. He would later tell Jeff Bradley of The Star Ledger, “I think it was the best World Series we ever played in,” illustrating he could find solace in the spectacle even though victory had eluded him. It was possible to be both happy for the nascent Arizona franchise and sorry for the Yankees at the same time. Athletes may dream about and actively pursue perfection, but perfection is only interesting in the abstract. Losing humanizes athletes in a way winning never can, and without a touch of humanity athletes risk becoming emotionless symbols with better physiques than the average person. Muhammad Ali had a more exciting and meaningful career because of his loss to and rivalry with Joe Frazier. The Larry Bird-Magic Johnson feud that captivated NBA fans in the ‘80s was so remarkable because both men lost at the hands of the other. Peyton Manning remains more likeable than Tom Brady in part because his postseason failures have been more compelling than Brady’s victories. Had Rivera won that game he would have seemed almost too perfect. Blowing that save diminished his postseason ERA but not his greatness. It showed that even the best mess up once and a while. Rivera recovered from that loss and pitched very successfully for another decade. The next season his ERA rose by .40 points, but from 2003 to 2006 he maintained an ERA under 2.0 and continued to serve as an exceptionally reliable closer. He showed no sign of ill effects from that loss and won another World Series with the Yankees in 2009. This season, Rivera has saved 44 games and posted an ERA of 2.11, illustrating he could continue to pitch if he so desired. As he steps down, he leaves behind an enduring legacy—a legacy that’s great in part because of his most memorable failure.